"Haifa, and Jaffa, and Acre... Every grain of soil in Palestine is part of blessed and holy Palestine. Palestine is an Islamic waqf. 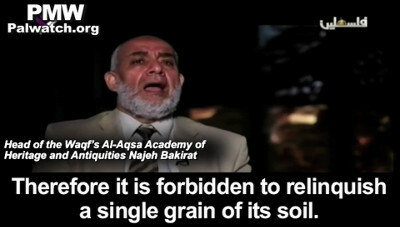 It is forbidden to relinquish a single grain of soil [of it]"
The Palestinian Authority is teaching its population that the conflict with Israel is based on a religious ruling which is identical to a significant religious ruling of Hamas. This Islamic religious ruling holds that all the land of the State of Israel is an inalienable religious endowment - a waqf - of which it is "forbidden to relinquish a single grain of soil." This means that Palestinians are prohibited from accepting Israel's existence in any borders as that is violating the waqf. 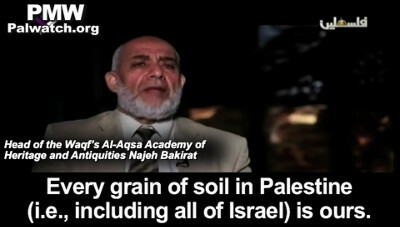 Head of the Waqf's Al-Aqsa Academy of Heritage and Antiquities Najeh Bakirat: "Every grain of soil in Palestine is ours. The status of Hebron is part of the status of Palestine, as it is an integral part of the Palestinian land, like the status of Nazareth in our eyes, and Haifa, and Jaffa, and Acre (i.e., all are cities in Israel). Every grain of soil in Palestine is part of the blessed Palestine, and holy Palestine which is a waqf (i.e., an inalienable religious endowment in Islamic law). Therefore it is forbidden to relinquish a single grain of its soil." The implications of this ideology must be taken seriously by Israel's leadership. Whereas in the name of Palestinian nationalism the Palestinian Authority still refuses to recognize Israel's right to exist, this ideology could potentially change were a peace treaty signed. However, when the Palestinian Authority teaches that the land of the State of Israel is on holy waqf land and that Islam prohibits recognition of Israel's right to exist, then there is no room for compromise, recognition, or change. This latest statement, that the PA sees itself as prohibited by Islamic law from recognizing Israel, is a reiteration of the same religious ruling that has also been announced by the two most senior religious leaders in the Palestinian Authority, both of whom were appointed by Mahmoud Abbas, as previously documented by Palestinian Media Watch. "The land of Palestine is waqf (i.e., an inalienable religious endowment in Islamic law). It must not be relinquished nor must any part of it be sold... He clarified: 'It is the duty of the leaders of the [Islamic] nation and its peoples to liberate Palestine and Jerusalem, to prevent the Judaization in it." "The entire land of Palestine is waqf (an inalienable religious endowment in Islamic law) and is blessed land... It is prohibited to sell, bestow ownership or facilitate the occupation of even a millimeter of it." Hamas Charter, article 11: "The Islamic Resistance Movement believes that the land of Palestine (i.e., including all of Israel- Ed.) has been an Islamic waqf [trust] throughout the generations and until the Day of Resurrection, no one can renounce it or part of it, or abandon it or part of it." Al-Habbash has made similar statements in the past, announcing that all of "Palestine" in general and the Temple Mount and the Western Wall in particular are an Islamic waqf. Mahmoud Al-Habbash: "The conflict here in Palestine between us and the criminal occupation ... [is] a further manifestation of the historic conflict between truth and falsehood, between good and evil... The evil is represented by the devils and their supporters, by the satans and their supporters. We are not inventing anything new here (i.e., Palestinian-Israeli). 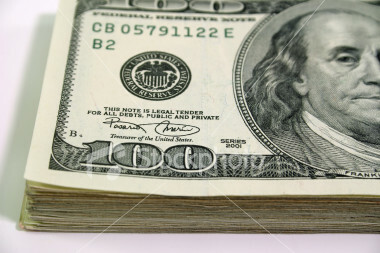 This is a conflict between two entities, good and evil, between two projects: Allah's project vs. Satan's project." The international community and Israeli leadership are basing the entire peace process discussions and negotiations on the false assumption that the Palestinian claims against Israel are nationalistic territorial demands that can be satisfied by territorial compromise related to the pre-1967 cease fire lines. However, since the PA has adopted Hamas' interpretation of the conflict as an uncompromising Islamic requirement to liberate holy Islamic land from the State of Israel, and is repeatedly teaching its population to see it this way, the approach to understanding the PA positions must be reassessed.